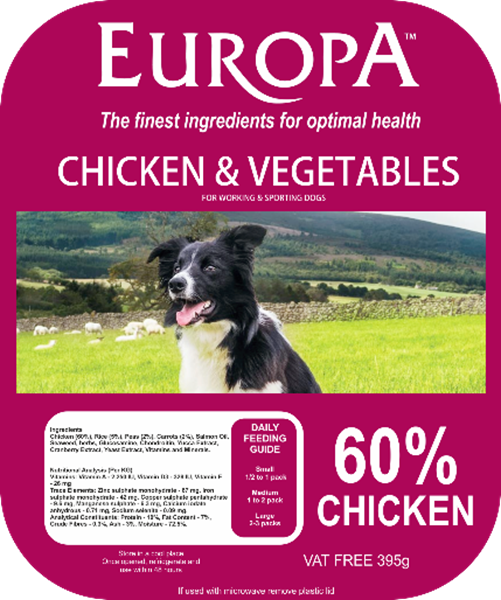 Europa Chicken & Vegetable wet food is a complete Hypoallergenic diet for adult dogs aged from 1 year and over. Europa Chicken & Vegetables can be given on its own or accompanied with biscuits which has proved great with even the fussiest eaters. With 60% Chicken this makes its a great diet for all dogs including working & sporting dogs. If you would like more information on what goes into your dogs food and how your dog benefits from a Europa diet please click the nutrition link below. This is an approximate feeding guide, the basic rule of the amount that a dog should eat is 2-3% of their expected adult weight, this is very important that you stick to the correct guidelines as to not over or under feed your dog. Chicken (60%), Rice (5%), Peas (2%), Carrots (2%), Salmon Oil, Seaweed, herbs, Glucosamine, Chondroitin, Yucca Extract, Cranberry Extract, Yeast Extract, Vitamins and Minerals. Please ensure your dog has fresh clean drinking water available at all times.